Laid out in the early sixteenth century by the Mughal emperor Babur, the site also known as Bagh-e Babur was rehabilitated in 2002 to 2008 after the Taliban were overthrown. The 27-acre park was restored to its majestic splendor in a major international preservation effort. A panoramic view of Bagh-e Babur, a 217-acre park in Kabul, designed by the first Mughal emperor, Babur, in the 16th-century. Emperor Babur was so enamored with his gardens in Kabul that before he died in India, he demanded that his body be taken from Agra for burial in Kabul. 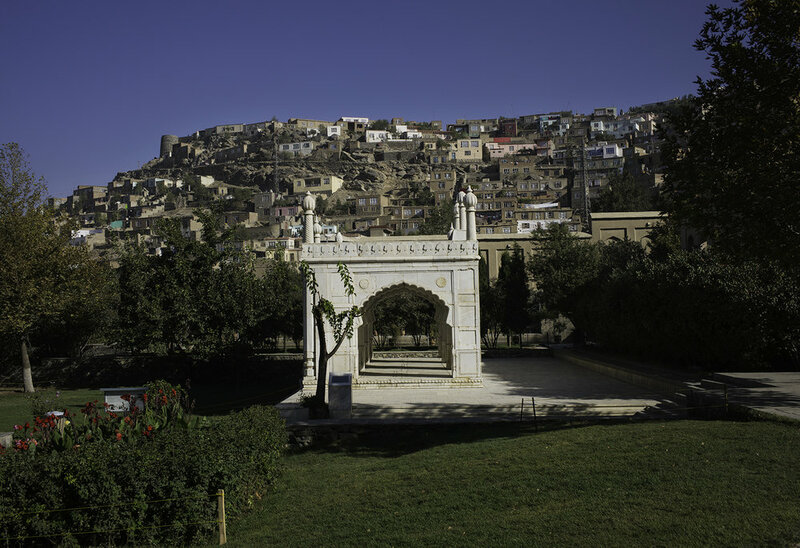 Much as Kabulis have done for centuries, families and youth flock to the restored Bagh-e Babur gardens for respite inside the garden walls. Youth are among the tens of thousands of visitors who find a reprieve from the noise of Kabul in Bagh-e Babur considered to be among the finest surviving examples of Mughal garden design. A large pavilion was built on the upper levels of Bagh-e Babur in the 20th-century by King Nadir Shah and it now serves as an exhibition hall. A caravanserai complex was added to Bagh-e Babur in 2004-2005. An employee sweeps the window ledge inside a gallery and exhibition hall in Bagh-e Babur’s main pavilion. The gallery pictures were taken by Josephine Powell in the 1960’s of Afghanistan’s historic monuments. The front view in Bagh-e Babur of a small white marble mosque built in 1647 by Mughal ruler Shah Jahan. The side view in Bagh-e Babur of a small white marble mosque built in 1647 by Mughal ruler Shah Jahan. A group of houses has grown above Babur’s Garden where an old fort called Noon Day Cannon Hill, upper left, still maintains a police security detachment. An employee walks to an office inside Bagh-e Babur’s large pavilion and exhibition hall.